Slice of Pi Quilts: Mini Madness! This year I have the incredible opportunity to work as an ambassador for Island Batik fabrics. Each month, all the ambassadors have a challenge to create something with a common theme. 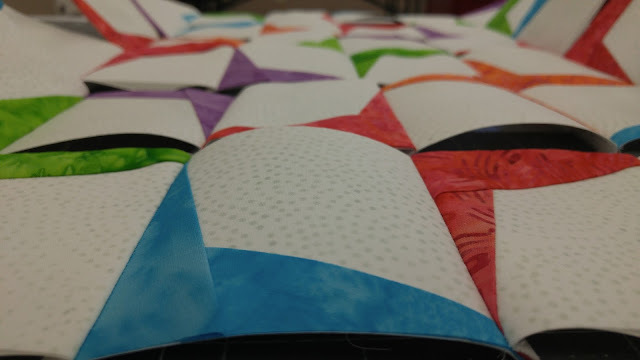 Last month, we made Galentine mug rugs and kennel quilts. This month, the challenge was to make a paper pieced mini quilt. I chose some bright fabrics from the Island Batik basics and blenders, and a neutral that reads as white. 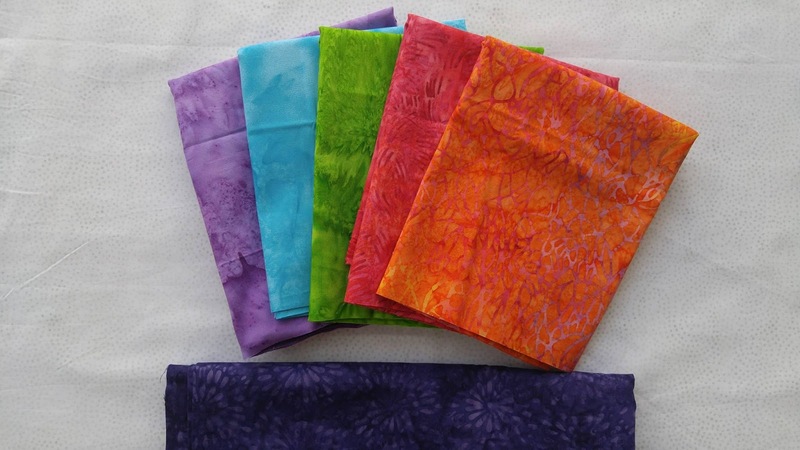 (Did you know batiks can be bright and colorful??) I love how these fabrics aren't quite solids, but aren't prints either. I played around in EQ7 for a bit before settling on 3" blocks with a "boomerang" design. It's a "simple" design, but I wanted the bright batik fabrics to be the focus! 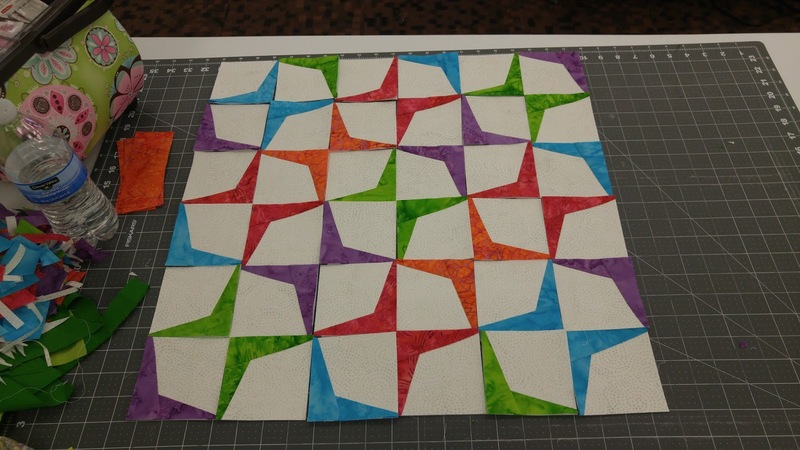 The small blocks would allow for an 18" square finished mini quilt. 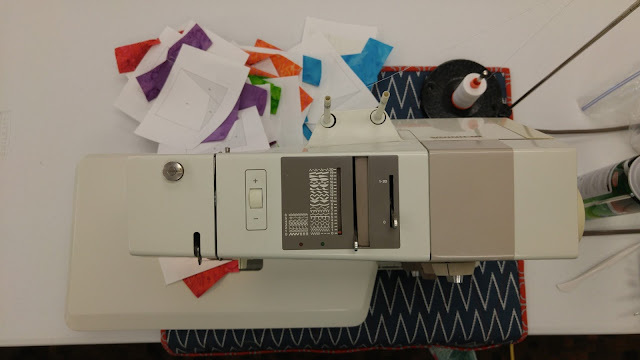 I printed the templates, tossed the fabric into my suitcase, and headed off to a quilt retreat (read about that fun weekend here)! Once at the quilt retreat, I cut 4" squares out of the white Sprinkles fabric and some rectangles from the colors to use for the blocks. 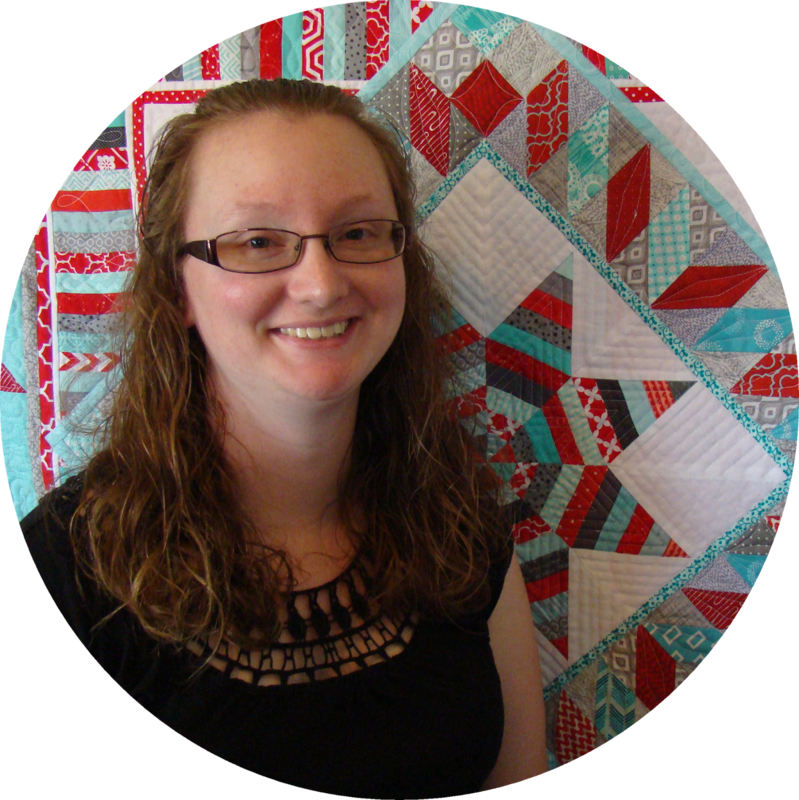 Being organized with my fabrics from the get-go allowed for me to chain piece and chat away at the retreat! 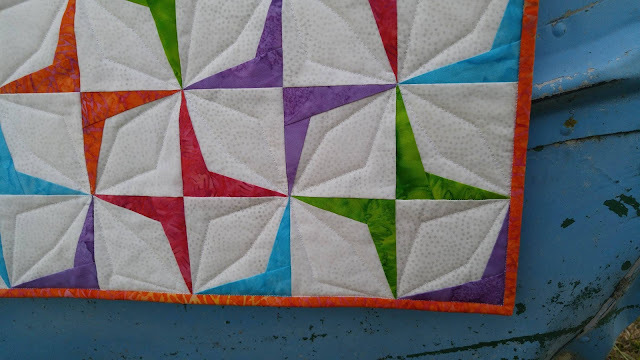 Once all the blocks were pieced, I trimmed them up and sewed them together to create the top. Next up was a good pressing before making the quilt sandwich. As usual, I pin basted. While designing the quilt and sewing the blocks, I could not come up with how I wanted to quilt it once finished. Even after having the top done, I just stared at it for a bit. Finally, I took the print out I had made in EQ7 and started drawing lines. Before long, I knew exactly what to do! 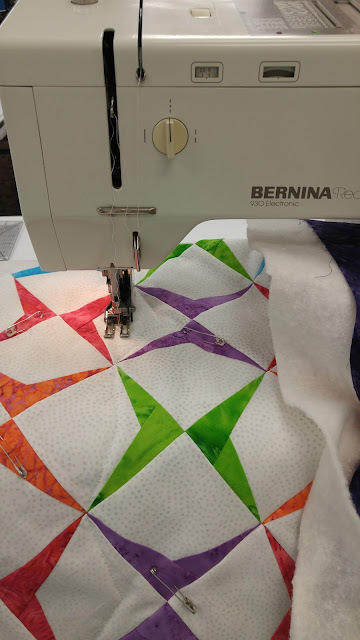 Using the walking foot on my vintage Bernina 930 Record, I quilted the diamond design onto the white sections. 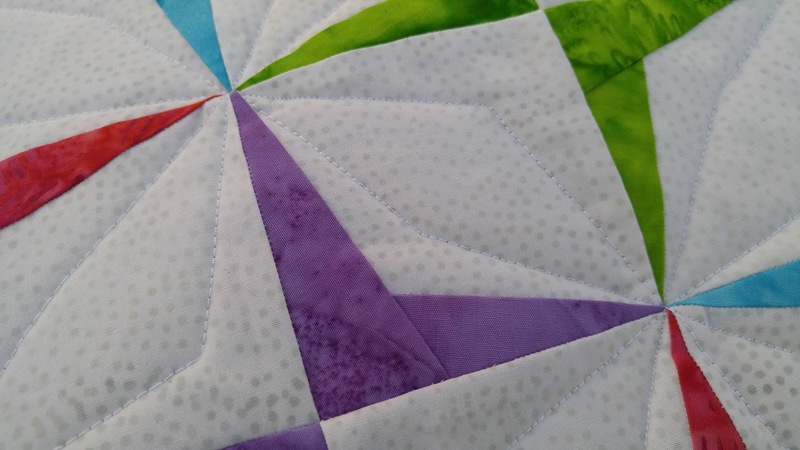 I did the "right" side of the diamonds, stitching all the way across the quilt. 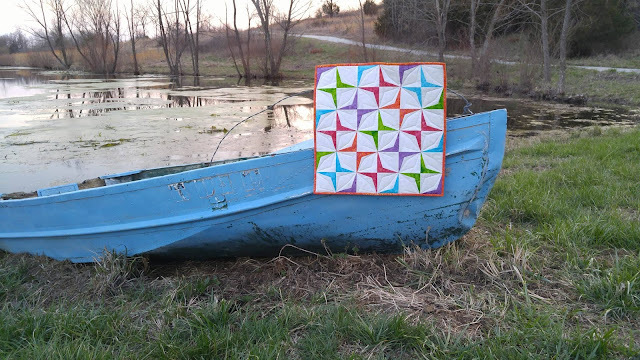 Then I would turn around and quilt the "left" side of the diamonds going back. After quilting, I trimmed off the extra batting and backing and added orange binding to finish the quilt. 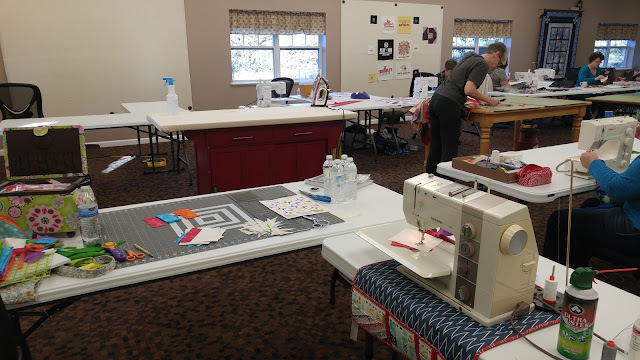 It felt great to start and finish an entire project in a single day without any interruptions from kids or washing machines or dogs or .... Did I mention how much I enjoyed the quilting retreat?? 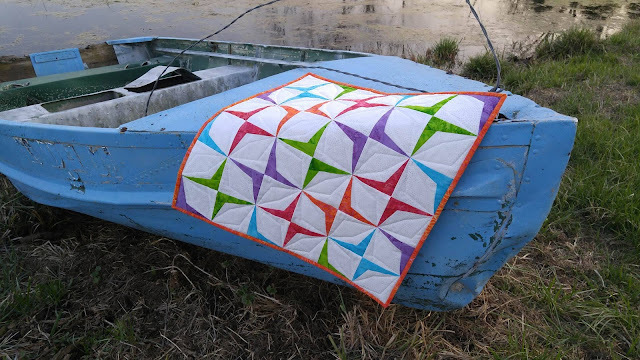 I love how bright and cheery this quilt is! I'm ready for spring! I'm sure the other Island Batik Ambassadors would love for you to stop by and see what they've been up to! 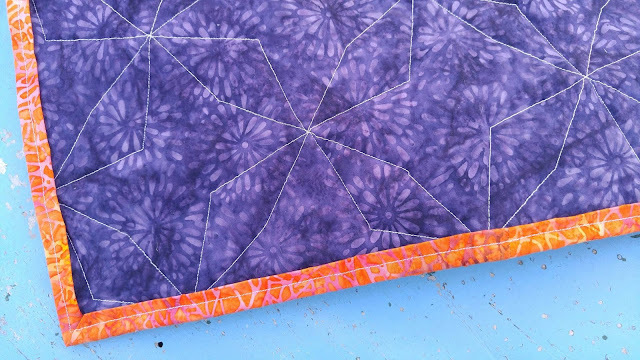 Linking up to TGIFF at Celtic Thistle Stitches, Can I Get a Whoop Whoop at Confessions of a Fabric Addict, Finished or Not Friday at Busy Hands Quilts, Needle and Thread Thursday at My Quilt Infatuation, Let's Bee Social at Sew Fresh Quilts, and Finish It Up Friday at Crazy Mom Quilts. From one IBA to another-It's beautiful!!! It looks wonderful, and I love the quilting! I was just making the exact block last night! It may be simple, but looks amazing! Such a pretty finish! What a fun design and great photoshoot! I love the white background with subtle pattern too! Oh it's so pretty! 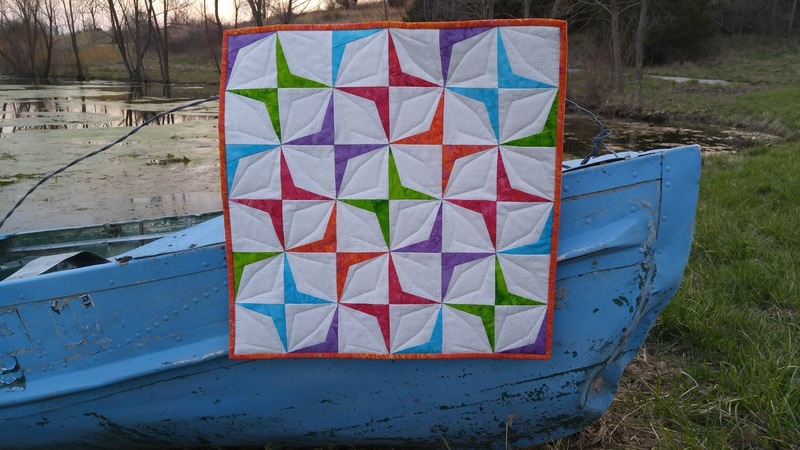 I love the design and the quilting turns the boomerangs into funky stars! I'm curious about the paper piecing - are you leaving the paper on right until the whole thing is a top? I'd always taken it off once they got to block stage but I'm curious to experiment to see if it makes me neater! Love your design! They look like butterflies. What a great box of stash you were given to work with! 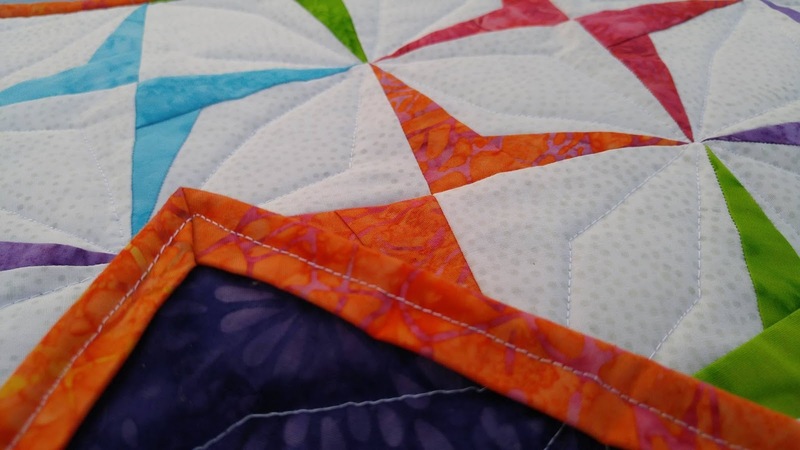 I like the quilting you decided on. Great little quilt! 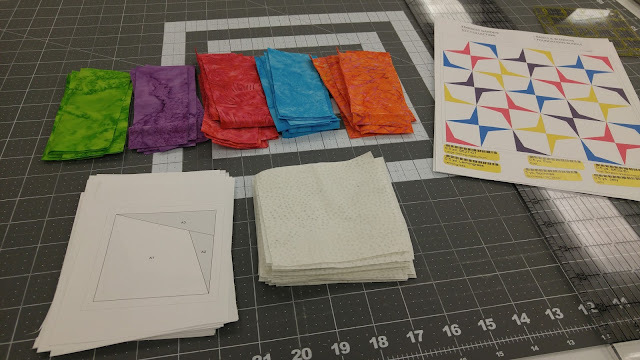 It helps to start with nice bright fabrics. This is so bright and springy. I love the colors on the white background, they really stand out. Love your mini - so bright and cheerful. I also REALLY love the boat! Aren't we having fun?! 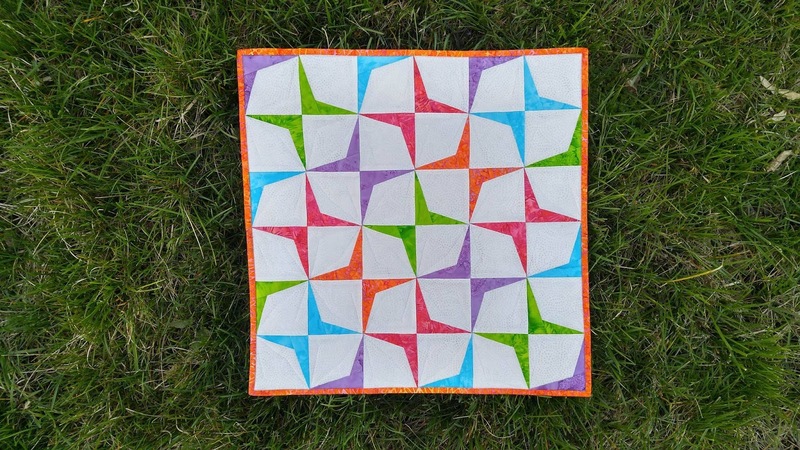 Less is more certainly fits your mini quilt. So perfect for spring. 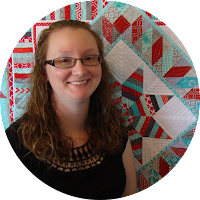 Popping over from the 2017 New Quilt Bloggers Hive~ Glad to be a Bee in your Hive! 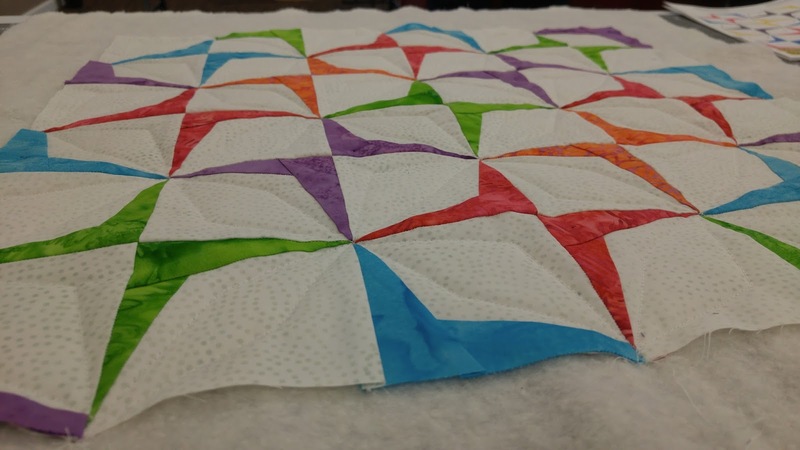 This mini quilt is beautiful!